In December, the CDC said 52,404 people had died from drug overdoses in 2015, with over 60% dying from opioids (prescription painkillers) and heroin. Overdose numbers have been rising for years, but the new research, published Monday in the American Journal of Preventive Medicine, suggests that those rates were dramatically underreported. The new paper posits that one reason for this gap is that in many overdose cases, no specific drug is identified as the cause on the death certificate. 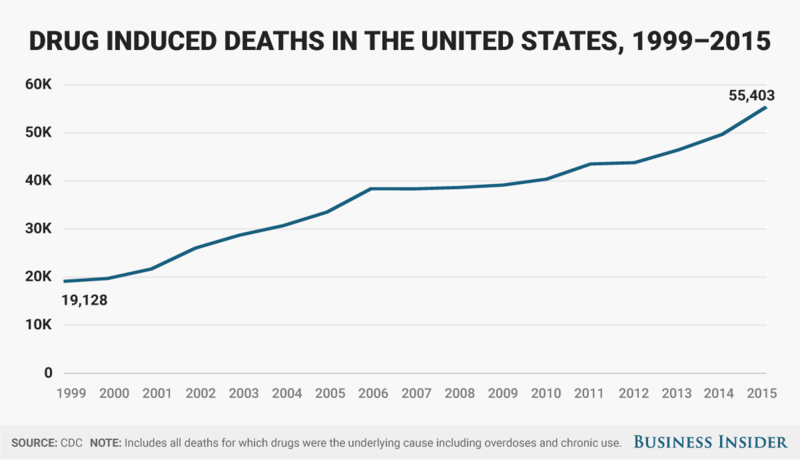 Data from 1999 to 2014 suggests that was the case up to one in four drug deaths recorded during that period. However, even in cases in which no specific drug is listed as the cause of death, officials often do list at least one category of drug based on screenings they do at the time. For the latest study, the researchers used that information to correct the data they had on drug overdoses — and their findings were stark. Nationally, corrected death rates from opioid painkillers were 24% greater than reported rates in 2014; those for heroin were 22% higher. These results change the face of the US' drug overdose epidemic substantially, as can be seen on the maps below. Reported overdose deaths for opioids and heroin are on the left; corrected deaths are on the right. The new analysis comes just four months after an investigation by a field officer for the Centers for Disease Control and Prevention also suggested that the death toll was higher than originally believed. CDC field officer Victoria Hall and her Minnesota-based team reviewed a decade of death records submitted to the Minnesota Department of Health's Unexplained Death (UNEX) surveillance system.